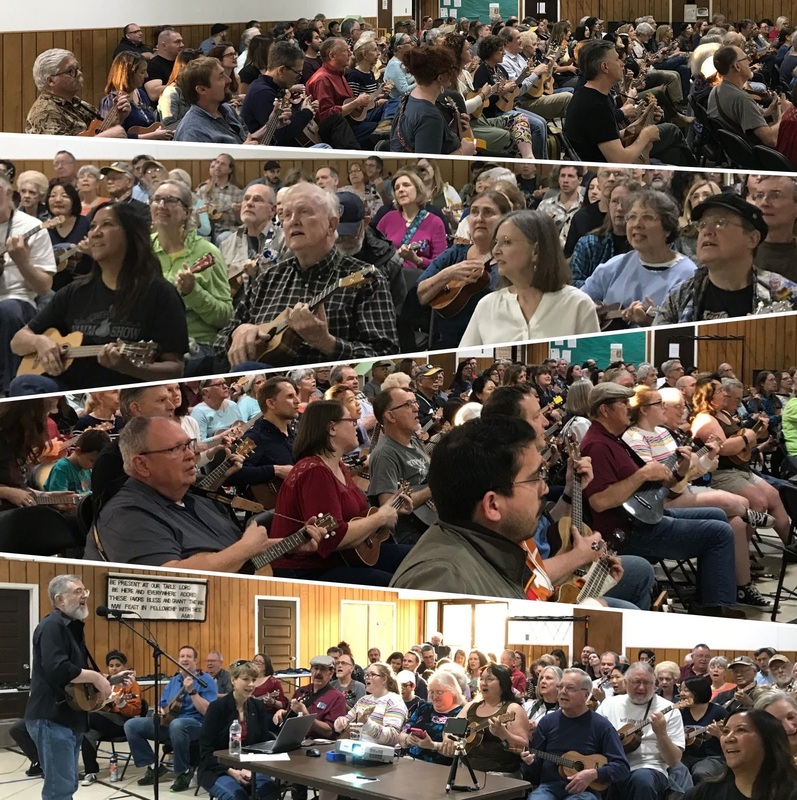 The Austin Ukulele Society was thrilled to host its 100th consecutive, always free and open to everyone, monthly meeting on April 11th, 2019, with over 200 members of our ukulele community in attendance! In addition to having in-person friends who drove from as far as Friendswood, TX, we were delighted to expand the horizons of our meeting’s attendance by live streaming part of the meeting, for the first time ever. 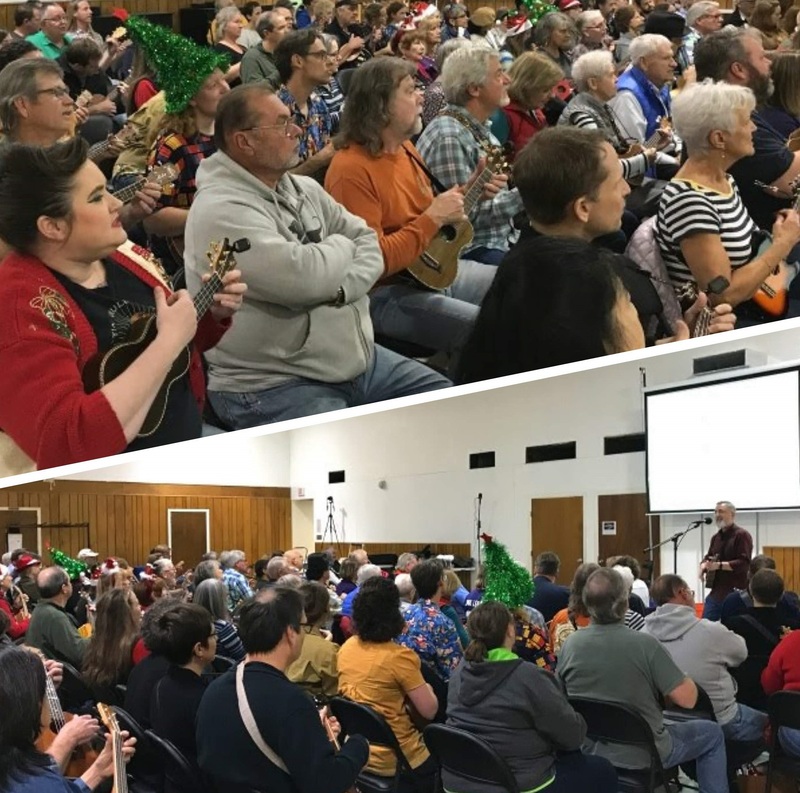 An additional 59 ukulele friends from far and wide, joined us virtually via our YouTube channel – and played along with us on our warm up song, Bob Marley’s “Three Little Birds.” You can watch a recording of the live streaming event on YouTube. To commemorate our journey to 100 meetings, we learned one of the most inspirational hits of all time: Journey’s 1981 classic “Don’t Stop Believin’.” Bob led us through some very helpful exercises and drills so that the group could get comfortable with the chord progressions, strumming styles, picking options and harmonies. We sounded better and better each time we played the song through. The added enhancements of Bob’s solo and Aaron Lewis’ u-bass playing truly added some magic to our interpretation of Journey’s epic tune. We appreciate all of the positive feedback from our YouTube ukulele friends! To play along with us, you can download the lyrics and chords for our arrangement of “Don’t Stop Believin'” or download a copy of the presentation and instruction guide (what we project on the screen for all to follow along, including exercises and drills). As always, we’re very grateful to our amazing open mic participants. Sho and Shin did a great Stevie Ray Vaughan cover, while Walter wowed us on a uke and kazoo version of a nearly-100-old-song tune. Jay did a rousing cover of the Beatles’ “Come Together” and welcomed plenty of audience participation. Kathy and Bill payed tribute to a dear friend and musician on an original song written by Kathy. Victoria performed a beautiful arrangement of Pink Floyd’s “Is There Anybody Out There” on guitalele. 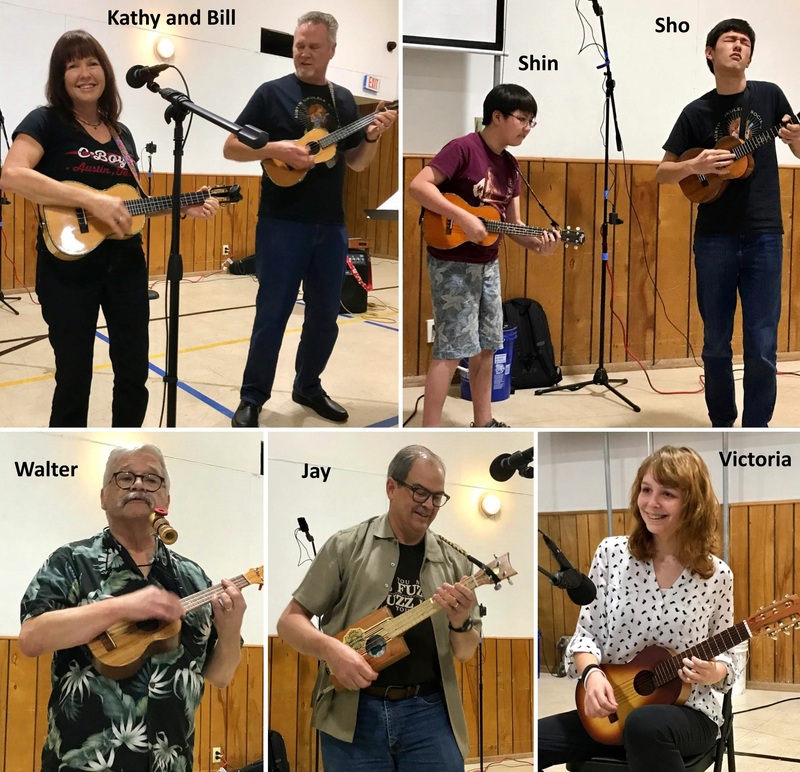 This entry was posted in AUS activities on April 16, 2019 by Austin Ukulele Society. Our March meeting is fast approaching! 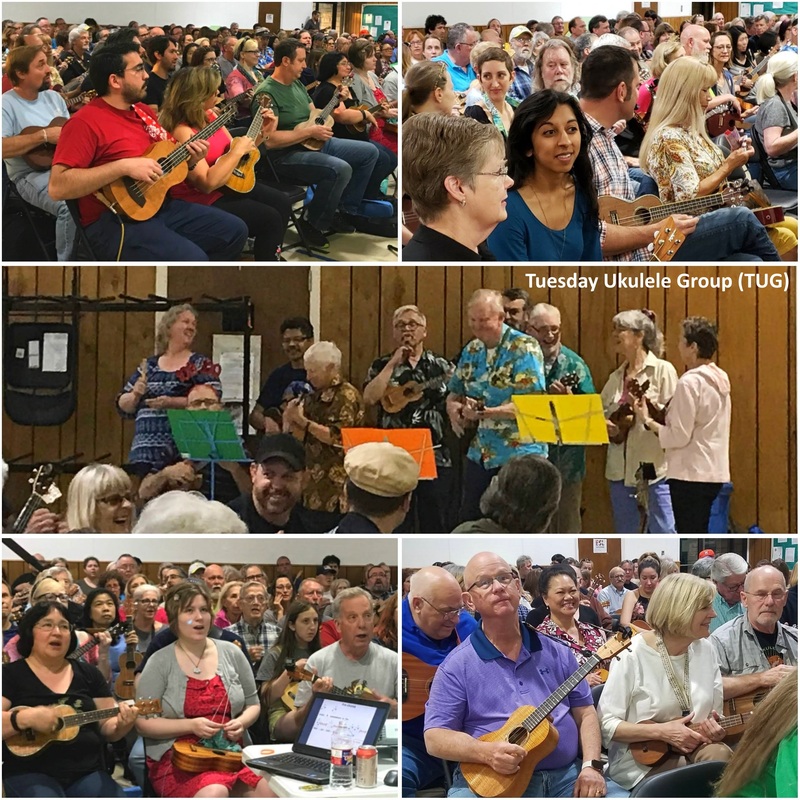 We’re looking forward to strumming ukuleles and singing harmonies with you at the Austin Ukulele Society monthly meeting on Thursday, March 14, 7:00–9:00pm! Be there to strum and sing along with ukulele players of all levels. We’ll meet, as usual, at the Memorial United Methodist Church, located at 6100 Berkman Drive, Austin, TX, 78723. Since we kicked off the year by learning classic tunes like “Sweet Caroline” and “Can’t Help Falling in Love,” we thought this month would be a good time to do a contemporary song. So we’ll learn to play and sing Florence + The Machine’s 2015 infectious hit “Ship to Wreck.” If you’re not yet familiar with this song, we know you’ll quickly see the appeal of its poppy pre-chorus and chorus as well as Florence Welch’s passionate vocals. You can practice “Ship To Wreck” by downloading the chord chart here. Like the original, the arrangement Bob prepared for us is in the key of C, so you can play right along with Florence + The Machine’s official video on YouTube. Also check out Florence’s terrific performance of this song on Saturday Night Live. Please spend some time previewing the full six pages of Bob’s downloadable arrangement. Pages 1 through 3 have the chord chart with lyrics. Page 4 has tabs for the riff that appears in the intro, chorus, and other spots. Page 5 shows the melody and harmony parts for the vocals in each chorus, and Page 6 shows the melody and harmony parts in the pre-chorus for the lyric “And oh, my love remind me…”. 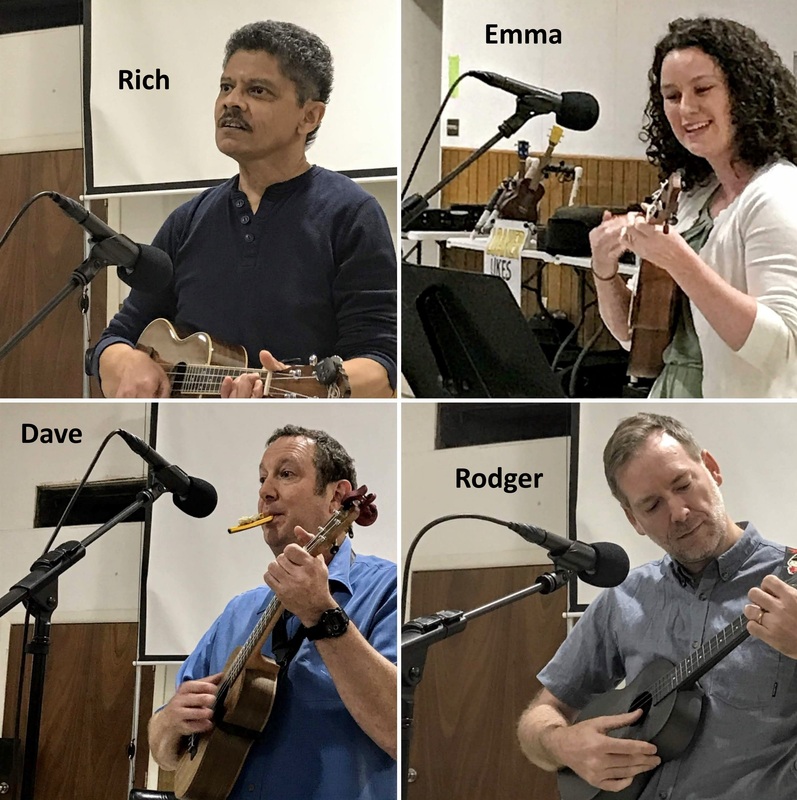 At the meeting, Bob will share more details about the song, perform it to demonstrate the arrangement, and then take us through some helpful exercises to get us comfortable playing and singing each component before we put it all together. We’ll also include some open mic time for those of you who’d like to showcase a tune you’ve been working on. A sign-up sheet will be available at 6:30. As open mic time is limited to five participants, please sign up when you arrive and understand that preference will be given to those who have not participated recently or ever before. 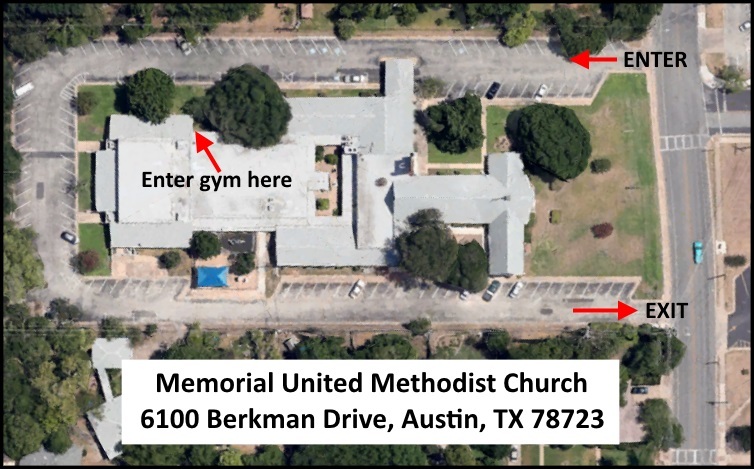 Memorial United Methodist Church, 6100 Berkman Drive, Austin, TX 78723. We meet in the school located behind the church, in the gym. Newcomers and beginners are ALWAYS welcome! Even if you’re a complete novice, we encourage you to come out. Many beginners come to the meetings, and it’s so great to see their skills grow over time! There are almost always easier ways to play the songs, even if you can play only a few of the chords. Or just sing along! Feel free to get familiar with the chord charts for any of the songs in our repertoire, all available on the “Music Library” page. We always play “Three Little Birds” and “On the Road Again” as our opening and closing songs, so if you’re new to the group and want to get familiar with them, you can play along using the presentations and our videos. As always, we’ll have plenty of Austin Ukulele Society t-shirts available for purchase – including our fabulous new “Ukulele Cowboy” design, crafted by the talented Lyda Guz and screen-printed right here in Austin! Available in 100% cotton navy blue in mens/unisex, womens, and kids styles. This new shirt and the “Mermaid” design cost $20; all previous years’ shirts are $15. We accept cash or a check made out to Bob Guz or Jen Richardson. We’re looking forward to seeing everyone on Thursday, March 14, at 7:00pm! Contact Us if you have any questions, need more information, or would like to be added to our mailing list. 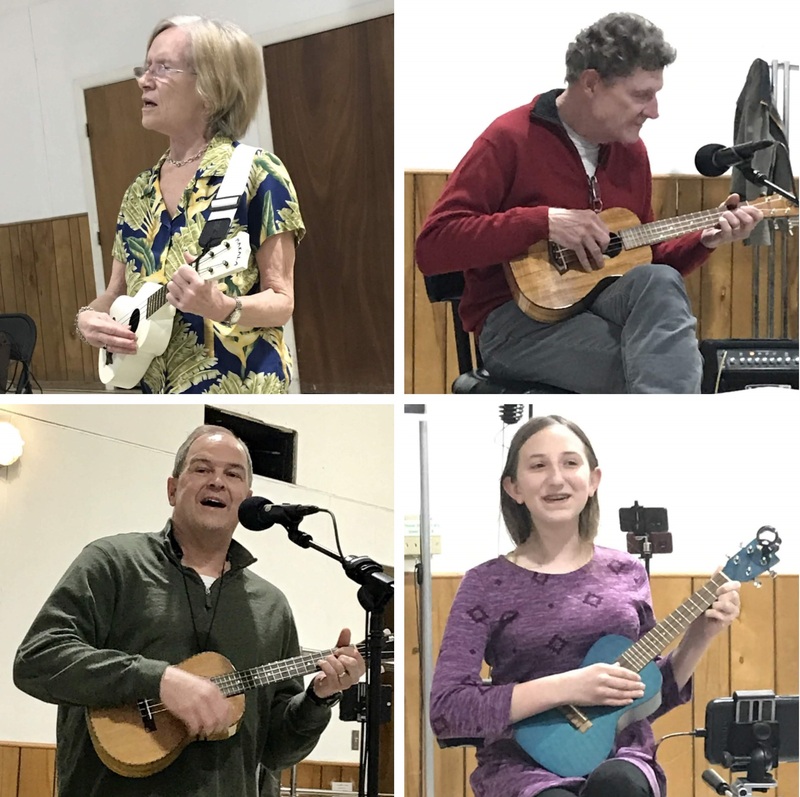 This entry was posted in AUS activities on March 7, 2019 by Austin Ukulele Society. To play along with us, you can download the lyrics and chords for our arrangement of “Can’t Help Falling In Love” or download a copy of the presentation and instruction guide (what we project on the screen for all to follow along, including exercises and drills). 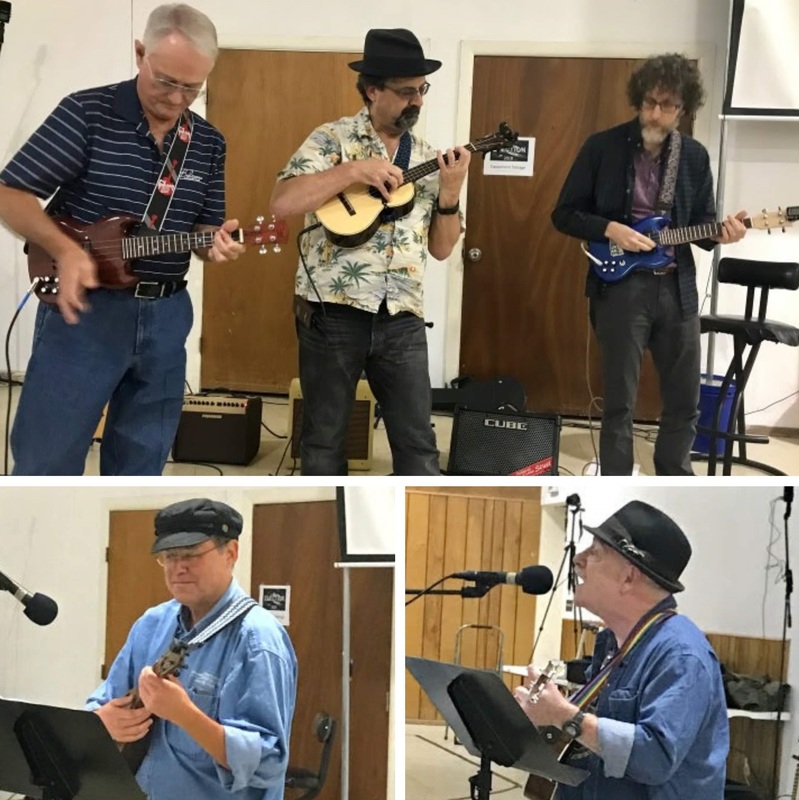 We took a break to enjoy the fantastic open mic portion of the eve, in which John and Sue, Peter (with John), Kit and Jack, Jay, and Vince all played songs full of love, joy and companionship. 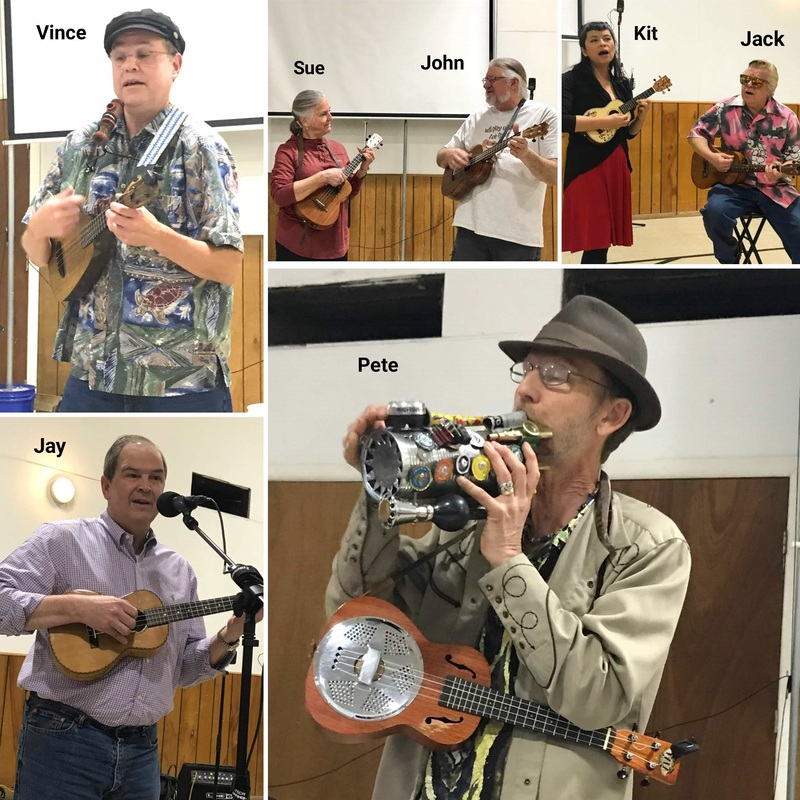 This entry was posted in AUS activities on February 20, 2019 by Austin Ukulele Society. 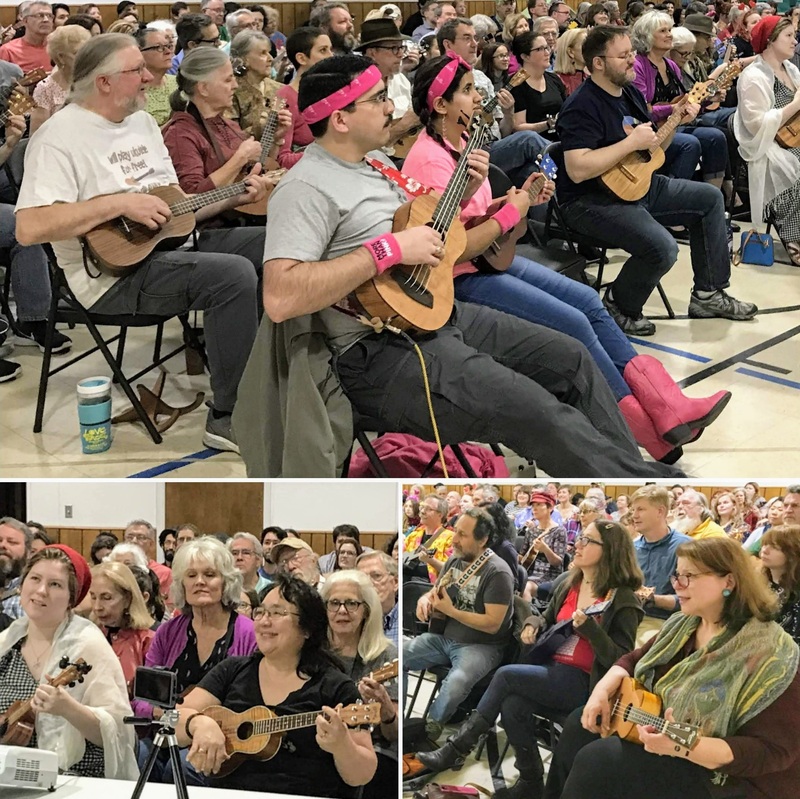 To kick off its 9th year, the Austin Ukulele Society was thrilled to welcome the biggest crowd of ukulele players we’ve seen yet, as we came close to nearly 200 attendees at last Thursday’s meeting! We started off with ukulele announcements and introductions, and we warmed up our voices and fingers by singing and strumming Bob Marley’s “Three Little Birds.” Bob G. demonstrated his arrangement of Neil Diamond’s “Sweet Caroline,” and we couldn’t help but sing along with him on this infectiously catchy classic. Bob took us through some helpful exercises and drills on the chord progressions, strumming techniques and vocal harmonizing options. 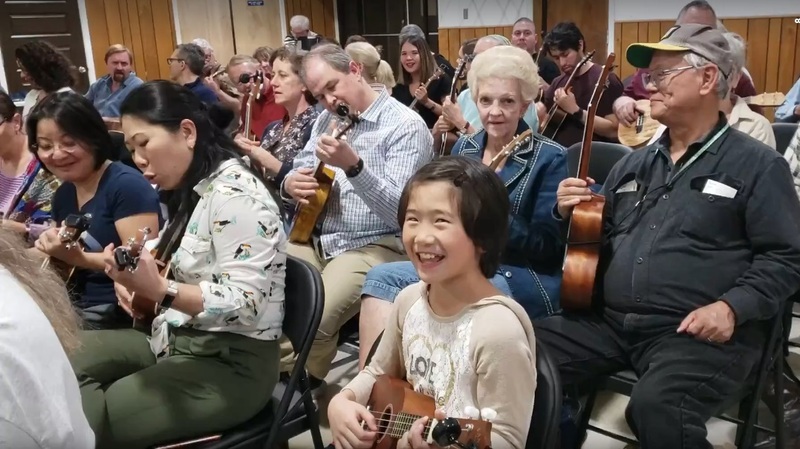 We put it all together and truly enjoyed playing and singing “Sweet Caroline” before recording it to share with our YouTube ukulele community around the world. We hope you enjoy it! To play along with us, you can download the lyrics and chords for our arrangement of “Sweet Caroline” or download a copy of the presentation and instruction guide (what we project on the screen for all to follow along, including exercises and drills). 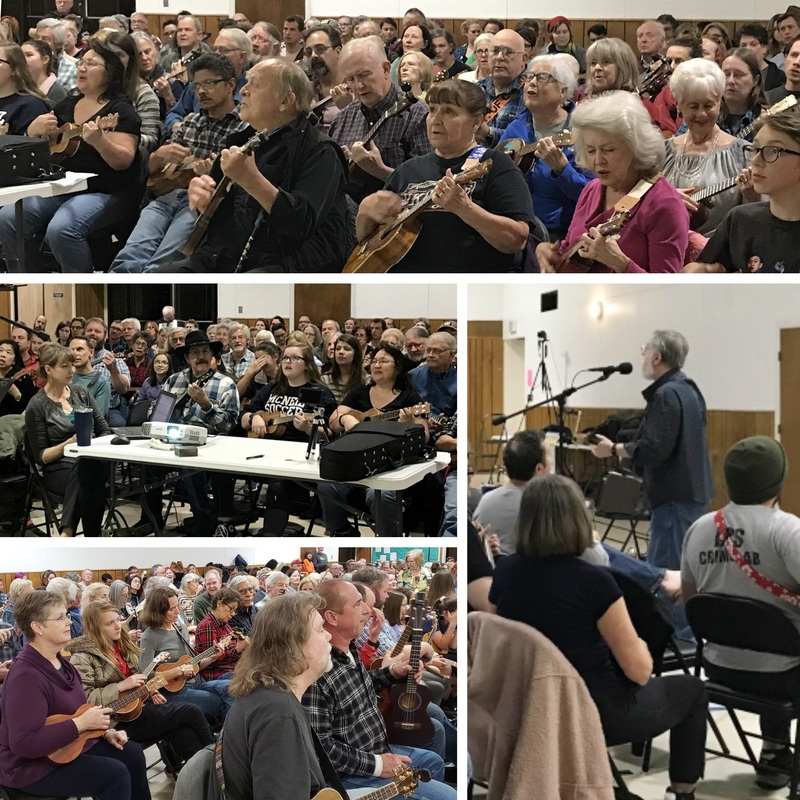 This entry was posted in AUS activities on January 13, 2019 by Austin Ukulele Society. 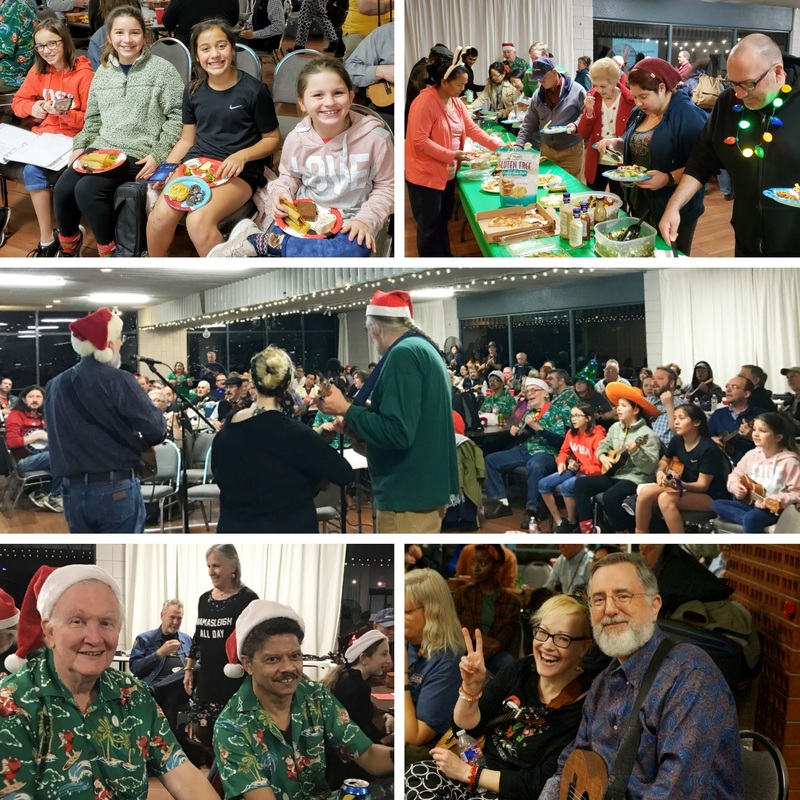 On a windy and chilly December evening, over one hundred Austin Ukulele Society members, friends, and family gathered for our eighth annual Holiday Potluck and Strum-a-long, at the High Road on Dawson. There was much merriment, as folks enjoyed socializing over food and drinks. 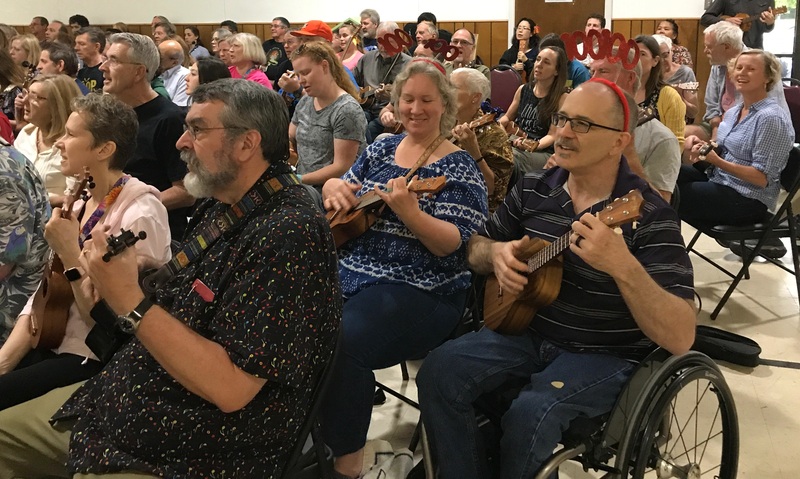 We also got out our ukuleles and Bob (with assistance from The John Davenport and Helen) guided the group through a strum and sing-a-long of our holiday song repertoire. 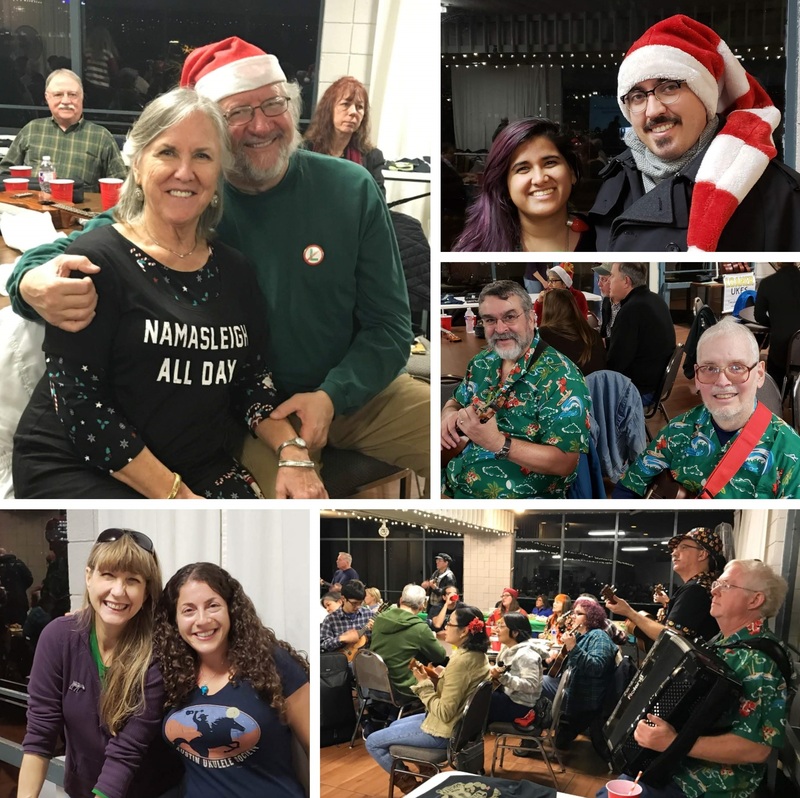 We are so grateful for the wonderful year we’ve had, making great music with our Austin-area ukulele friends. We’re wishing everyone peace, love, and joy through the holiday season! 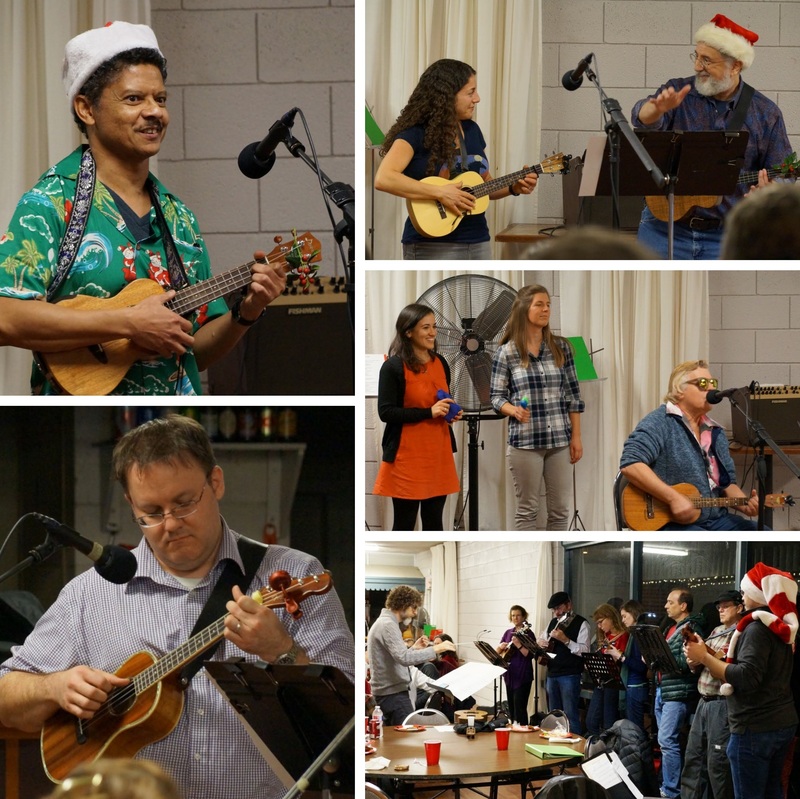 The group was treated to an extended open mic session, with a great variety of holiday and winter tunes in the mix. 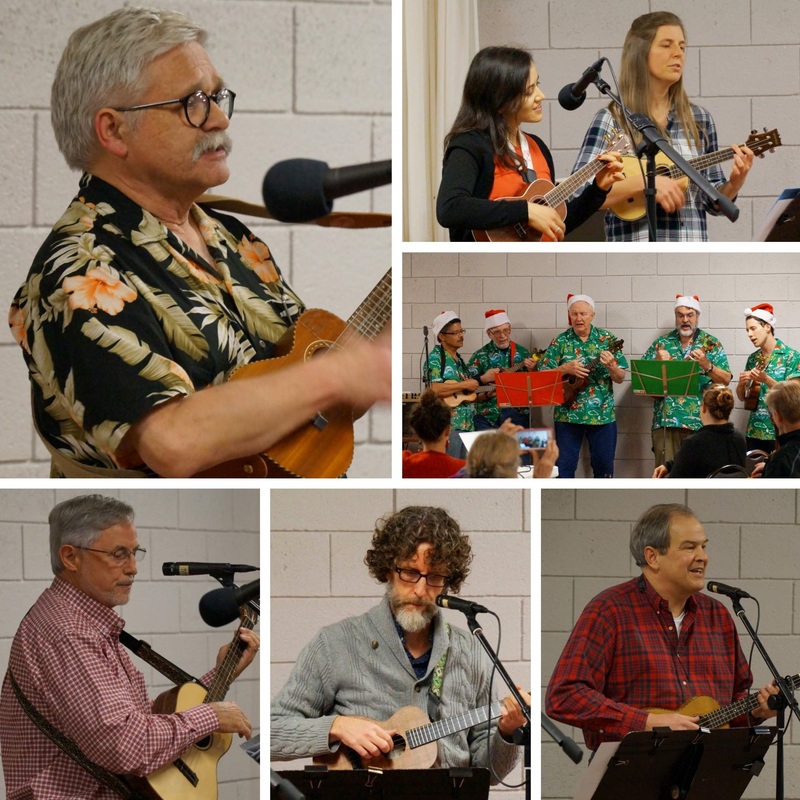 A big thanks to Bob and Jen, the Ukestra, the Tuesday Ukulele Group (TUG), Ray, Erin and Gabrielle, Rich, Alex, Jay, Kevin, Walter and Jack for sharing their talent and takes on so many fantastic songs. Download our 2018 Holiday Songbook, which contains the chords and lyrics for all of the songs below in one handy PDF booklet designed to minimize page turns when printed two-sided! 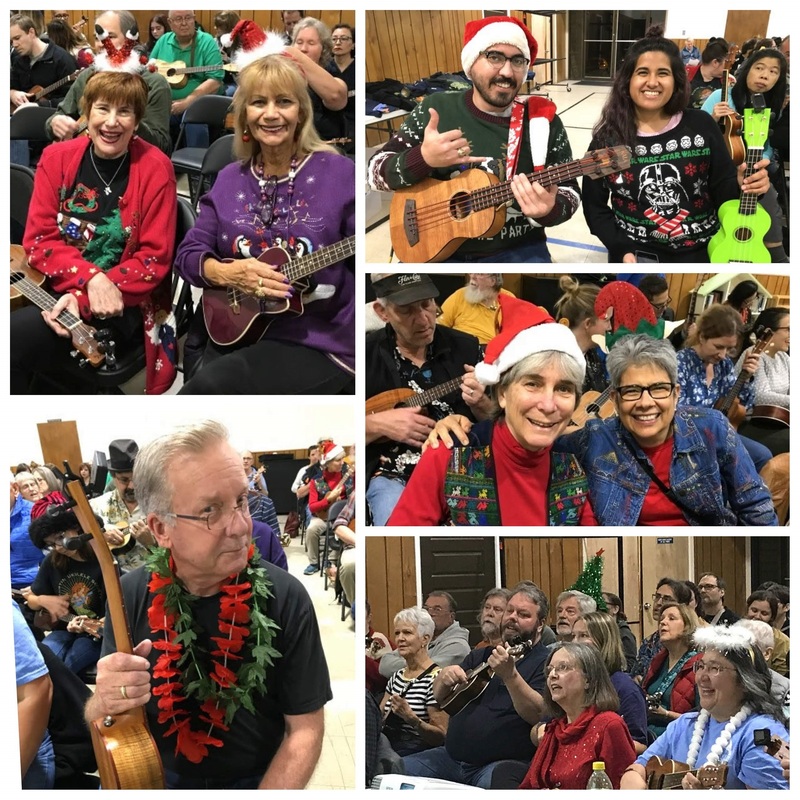 This entry was posted in AUS activities on December 18, 2018 by Austin Ukulele Society.